It’s a rare occasion that we republish one of our posts on this site – but April 1st is a special day, is it not? And as the weather warms, a little bit of lighthearted Spring frolicking won’t go amiss. It was unlike me to have missed acknowledging the Vernal Equinox last week but please note that it wasn’t forgotten. In much of the northern hemisphere spring began sprouting all over the place, sometimes unseasonably early, and the first day of spring was observed in all its glory in Crist’s Holi series. So I’m being careful not to miss April 1st and in the spirit of that celebration am sharing some of artist Ken Brown‘s collection of turn of the century (the 19th to the 20th that is!) 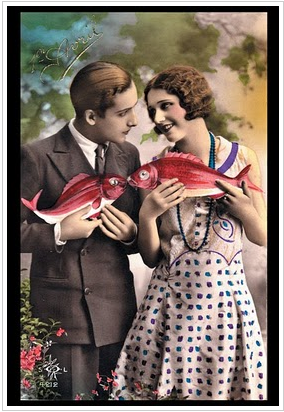 French fantasy postcards that celebrate “Poisson d’Avril”, the French equivalent of April 1st or April Fools’ Day. Spring is celebrated with a sense of color and frivolity throughout the world (think May Poles!) The origins of April Fool’s Day are believed to be based on the shift from the Julian to the Gregorian Calendar ordered by King Charles IX in 1582. Before the calendar shift people had celebrated the New Year on or around April 1st, following the Spring equinox and often related to the coming of Easter. Gifts were traditionally exchanged, often of food. Since this “new year” coincided with the period of Lent during which the consumption of meat is forbidden for Christians, fish would have been a gift that stayed within proper form while representing esteem. As this reform took literally centuries to be adopted universally (relatively that is) sometime during French history it became popular to tease the lower class or less educated people who didn’t follow (or forgot) the “modern” calendar, referring to them as “April Fish”. They were often on the receiving end of hoaxes and pranks and thus came the beginnings of April Fools’ Day. The typical joke played by children in France is taping a paper fish on the back of an unsuspecting victim, who then might go throughout the day the recipient of giggles and glances until they realize the situation. Laughter aside, the best part of Poisson d’Avril is the plethora of chocolate fish in every chocolatier and pâtisserie window.